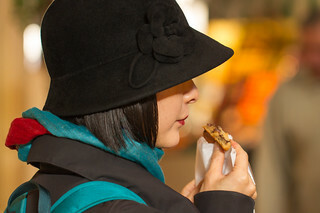 This elegant woman was enjoying what I am pretty sure was a Ben's Cookie in the Oxford Covered Market. I tried to catch her eye to ask to take a proper portrait but she eluded me. Ben's Cookies have been making chocolate cookies near Oxford since 1983. The company motto is "Baking with chunks not chips".